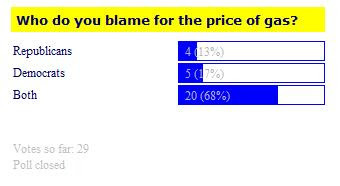 Looks like the poll voters blame both political parties for the high price of gas. The vote totals are to the left. Also, we've got a new poll at right. Would you ride Metro Rail if it were extended further? NFTA mentioned the possibility at a press conference today.